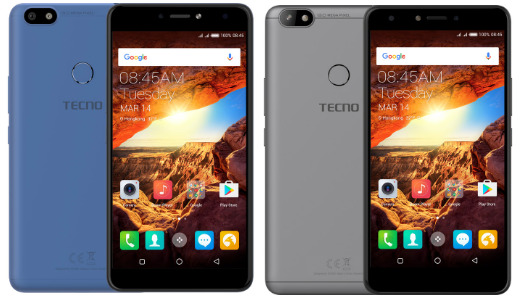 Tecno is back with two new devices they claim to target youths and social media enthusiasts, the Tecno Spark and Tecno Spark Plus. The Spark is also known as K7 while the Spark Plus is known as K9. The both devices features premium look design and runs on the latest Android 7.0 Nougat Operating System. The Tecno Spark (also known as Tecno K7) is a 5.5-inch display device in a premium-looking plastic body. The Spark is the lower version of the Spark Plus, featuring a 1GB ram and a 16GB internal storage space that can be expanded using MicroSD card. The device has a 5.5-Inch display size with a 5MP front camera and 13MP back camera with flash. It support a fingerprint unlocking located at the back below the camera. It does not support 4G LTE network, only 2G and 3G. It has a removable 3000mAh battery capacity. The performance of the SPARK is enhanced with a 1.3GHz Octa-core MediaTek CPU that enables it withstand multitasking. Access your phone via the fingerprint sensor module securely and speedily. It reads your fingerprint and identifies who you are. The more you use it, the more intelligently it responds. Launch the camera and use the fingerprint sensor as a handy shutter button for recording your life on the move. Running the latest Android™ 7.0, the SPARK delivers a fluid multi-tasking experience never ever before. Launch your favorite apps and engage in the entertainment now. The Lock screen has been redesigned to display Lock screen wallpaper in fullness. Multiple wallpaper and themes are available for customizing your device at a single touch. GPS, Bluetooth, WIFI, Hotspot and FM Radio Support. The SPARK Plus (also known as TECNO K9) features a much bigger screen size and battery capacity than the Spark (above), the Tecno Spark Plus has a 6-inch display and a 3400 mAh battery. In addition to those two, another major feature to this device is the availability of the 4G LTE for super fast internet access and a Ram size of 2GB. The device is enclosed with 2.5D glass that meets the sleek body for a seamless finish. SIM tray does not only provide the option of accessing different carriers at the same time, but also makes a natural part of the unibody. Your phone boasts of a 7.75mm slim body, which rounds off in the corners for a comfortable grip. All attention will be on you as the device reflects your style effortlessly. The fingerprint sensor module is crafted in metal to render you that super-sensitivity you expect. Unlock your phone at a single touch. Put your finger on the sensor in camera mode to capture photos instantly. Your individual password does not only keep whatever stored in the phone secure, but also keeps all sweet life moments without delay. With 16GB of on-board memory that is easily expanded to 32GB, it has never been easier to pack your favorite apps into one device. That's exactly why 2GB of RAM has been adopted for SPARK Plus. Don't wait for the wonderful things to happen one by one. Launch multiple apps at one time, switch between freely and get totally immersed in the entertainments. Clear cache periodically for maximum speed.